Bucharest is the capital of Romania and one of the largest cities in Eastern Europe. Romania is very well connected to the other European capitals and also with the cities within the country. There is no problem to get direct low cost flights to Romania from the major cities in Italy, Spain, Germany, France, UK, Belgium, Hungary, Turkey, Austria, Israel and many others. All low-cost commercial flights land at the Henri Coanda International Airport (Otopeni) built in 1990. It went through many changes and improvements, the last one being finalized in 2012 when a new departures terminal was opened, doubling the airport’s processing capacity. It offers passengers a very wide range of facilities, among which a pharmacy, bank, ATMs, a chapel, shops, exchange, bars and restaurants. Bucharest also benefits from the presence of the Aurel Vlaicu International Airport also called Baneasa that is located 9km North to the center of the city. However, you will not need to worry for reservations since our team of dental tourism specialists is ready to help you find the best solution for you. We just need to know your preferences in regards to your flight and we will take care of everything. Also, you will not have to worry for your ride from the airport to the hotel since we will ensure your comfortable transportation with our cars, with no extra fee. As the primary entry point inside the country, Bucharest also offers the option of transportation to Romania by car, train or bus. It is easy to get a direct train line to Bucharest from all neighboring capitals like Chisinau, Kiev, Sofia, Budapest but also from countries like Austria, Greece, Italy and Turkey. The largest train station in Bucharest, “Gara de Nord” (translation: North train station) has an average number of 200 trains transiting the station on a daily basis. Traveling by train is one of the most popular methods of transportation through the country. There are 3 price services: Regional (R) the cheapest and slowest type of train, the InterRegional (IR) which is faster but more expensive and the Inter-City Trains (IC), the priciest option, which will get you to your destination in a fast and comfortable manner. The last two options are also equipped with sleepers and dining cars. There are multiple entrances in Bucharest coming from international roads, like E60 in North, A1 highway in West, A2 highway in East and E20 from South. We will spear no effort in making sure your travel will go as smooth and comfortable as possible. 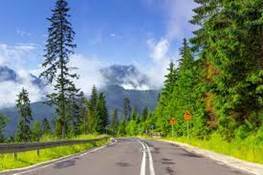 Multilingual inhabitants, moderate climate and the well connected transportation network are factors that will surely make your dental travel to Romania more comfortable. Contact us and let’s plan together your traveling and accomodation in Romania!